A new day seems to have dawned. Exhibitors at the Fort Lauderdale International Boat Show celebrated not only the show&apos;s 50th edition, but also a ray of real hope and a reprieve from the unremitting bad news of the last two years. Under sunny skies, with stocks ticking up and the U.S. economy showing signs of life, show-goers finally were in a mood to shop and even buy again. Efrem "Skip" Zimbalist III, president and CEO of Show Management, the show&apos;s organizer, reported significantly fewer small boats on display than last year, but a record 155 yachts over 100 feet and a healthy 100 or so boats from 90 to 100 feet. "I was thrilled with the way the show turned out," he says. Attendance wasn&apos;t anything to write home about - "flat to 1 percent over last year," Zimbalist says, which was off 4 percent from 2007. Crowds were up 10-plus percent through Friday, but family turnout dropped on the weekend, perhaps signaling new market realities: fewer dreamers at the shows, the return of the serious boating enthusiast, less product for fewer buyers, and - judging from dealer reports - more cash sales to those who are fortunate in these tough times to be flush with money. "Sales were made, the weather held, crowds were [reasonably] strong - everything fell into place," says Frank Herhold, executive director of the Marine Industries Association of South Florida, which owns the show. "Even in these times I call the &apos;new normal,&apos; the show remains a bellwether and I think this year it&apos;s a positive bellwether for the industry. This industry is very resilient, an optimistic industry, and we tend to look more to the future than the past." Boat introductions again were down from pre-2008 numbers, but several builders unveiled new models. Grand Banks added its pod-drive offerings with the Zeus-powered 46 Eastbay SX; Donzi Yachts by Roscioli launched the R-73 open flybridge sportfisherman; Mochi Craft&apos;s new Long Range 23 is a hybrid power cruiser; Vicem Yachts debuted its 72 Classic Flybridge and showed its 92 Cruiser for the first time at Fort Lauderdale; Selene Ocean Trawlers showed its new 60-footer; and Bertram unveiled the 511 sportfisherman. Other debuts came from Sea Ray (450 Sundancer), Grady-White (Canyon 366), and Boston Whaler (320 Outrage). A lot of the boatbuilders were pretty happy, because the Lauderdale show is one of their last chances to display boats to big crowds before the winter show season. Lauderdale Marina sold "nine to 10" Boston Whalers and a similar number of Pursuits - a new line for one of Fort Lauderdale&apos;s oldest dealerships, says Scott Clark, vice president and general manager. Some of the sales were at the upper end of the product line - $412,000 Boston Whaler 370 Outrages, 34-foot Conquests, and 34- and 37-foot Pursuits - while others were at the low end - a $12,500 runabout, for example. Most were 2010 models. Clark says he had cleared out his 2007s and &apos;08s and most of his &apos;09s before the show. He says his sales staff didn&apos;t have to deeply discount the 2010s. "For us, this was a turnaround point," he says. 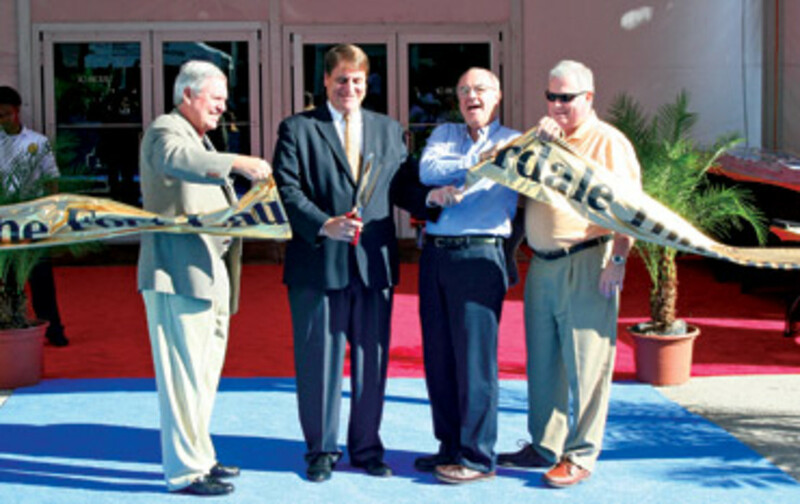 Exhibit space at the Fort Lauderdale Convention Center was scaled back significantly, but some smaller builders there still reported strong sales. "We had a surprisingly strong show, with six boats from 17 to 33 feet sold so far," says Peter Truslow, president of EdgeWater Powerboats. All were cash deals - two 17-footers and an 18-, a 26-, a 31- and a 33-footer, according to Truslow. "We also have some other orders coming in from our foreign dealers and expect to close more deals," he says. The Sea Fox & Mariah Boat Company reported a nearly 54 percent increase in sales from the 2008 show. "It looks like we got 20 solid sales with a possibility of a few more," says Jeff DeBar, senior vice president of sales and marketing. Most were cash buyers and didn&apos;t need financing. "This is a 180-degree change from years past," he says. "If the 20 sales stick, this would be better than the 13 [boats sold] last year." 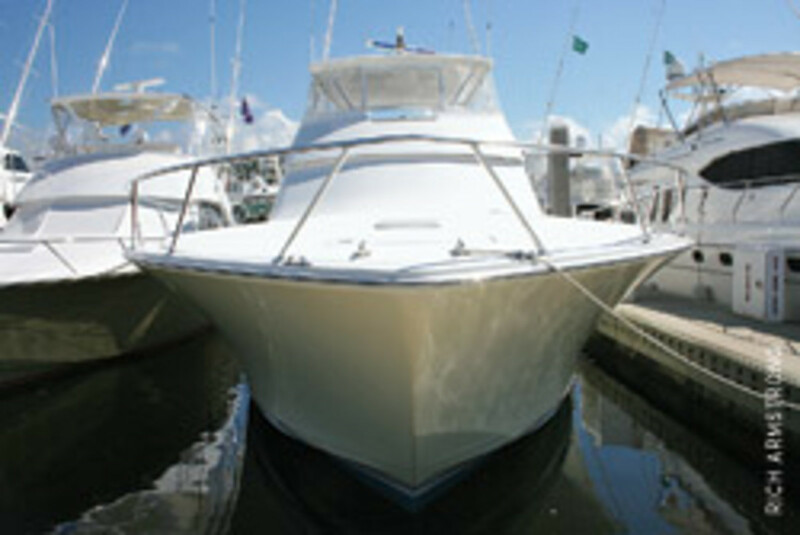 Everglades Boats, which builds saltwater fishing boats from 21 to 35 feet, took 14 deposits. "I&apos;m ecstatic," says Greg Allen, vice president for sales. He says exhibit space at the convention center was down dramatically, but Everglades saw good traffic there. Buyers seemed to understand that 2010 inventories are way down, so if they want a new model they better buy it early, says company president Bob Dougherty. Out on the Bahia Mar docks, Grady-White dealer Pompano Beach Marine Center reported modest sales. "We sold some smaller boats this year compared to last year," says salesman Michael Zantop, noting cash sales of an 18- and a 20-footer. He says another customer wants to move up from a 33-foot Grady-White to a 36-footer, but the sale is pending the dealer finding a buyer for the trade-in. Zantop says a half-dozen Canyon 366 sea trials were set up and the dealership came away with "several good leads." Among the luxury-yacht builders, Robert McDougal, president of Allied Marine, which sells Ferretti Group&apos;s nine lines, issued this statement about the show: "We were cautiously optimistic going into the show. Today, we can say that we are pleased with the number of written contracts for both new and brokered boats coming from the show. We are on track for achieving our goals." Megayacht brokers, who have seen a 20 to 25 percent sales decline during the recession, also were upbeat. "The traffic was definitely off from years past, but the quality of the buyers was great," says International Yacht Collections broker Jim Eden. "I had two serious new clients and was working with three existing clients on brokerage boats. Two new guys of this quality in these times at the show is just great." One of the new clients was shopping for a 150- to 160-foot new build, while the other was looking for a 120- to 130-foot brokerage boat. After two years of slippage, megayacht brokerage prices are creeping up again, says Eden. "The boats are selling," he says. Others were more circumspect about where the market is. Bob Roscioli, president of Roscioli International, which introduced its new Donzi R-73 Tournament Sportfish at the show, still finds the market tough going. "It&apos;s all about deal-making," he says. "Everything&apos;s a deal. People know that. You can pick out just about anything you want and make a deal." Dealing is easier when buyer and seller can agree that the market has bottomed out. "Where is the bottom?" Roscioli asks. "I&apos;m not convinced we&apos;ve hit bottom." Dirk Boehmer, the new president of Vicem Yachts USA, got off to a good start at the Fort Lauderdale show. His last day as sales director at Bertram Yachts was the Friday before the show. He started work at Vicem on Monday, and on the day before the show&apos;s Thursday opening, he sold two boats - a 52- and a 72-footer. "We&apos;re very, very excited and very positive at the moment," he says. Vicem, a Turkish company that builds cold-molded motoryachts, introduced a $4.25 million 92-footer at Lauderdale. Boehmer says Vicem has some advantages in this sluggish market. Because the yachts are built in Turkey, they are very competitively priced, but they also are distinctive. He says the finely crafted wood yachts show well in a sea of plastic. Looking forward to better times, Vicem plans to introduce 150- and 115-footers - in fiberglass - in 2011 at the Monaco International Boat Show, Boehm says. The folks at Cigarette Racing were smiling, too. They had some good news to share at the Florida Powerboat Club bash Friday night at the Bahia Cabana, just up the road from the show. Cigarette had sold a $450,000 39-foot Top Fish center console with quadruple 350-hp Mercury Verados. The model is an all-around family fishing and dayboat, with sun pad and retractable table at the bow. It is versatile, and that sells, says spokeswoman Marilyn DeMartini. Still awaiting a suitor: the $899,000 49-foot Grand Sport, a new sport cruiser for the "mature" Cigarette owner. The boat is big and sleek and includes such features as a full galley, stand-up head, flat-screen television, surround-sound system, and queen-size berth. "It&apos;s purpose-built for cruising," says test driver Bud Lorow. Rich Lazzara, vice president of Lazzara Yachts, says the show couldn&apos;t have started better for the Tampa yacht builder. The company sold an LSX 78 with a price tag of just under $4.5 million on opening day. "It&apos;s the first time we&apos;ve done that in a few years on the first day," he says. Fort Lauderdale gave some builders the chance to show they still are very much in the hunt. "We&apos;re alive and well," says Michael Myers, president and COO of Bertram Yacht, responding to rumors that the venerable boatbuilder is in financial trouble. "When things got soft, any [model] without orders we just stopped building." Bertram has moved toward a build-to-order business model, as many builders have, but its production line never shut down. "We&apos;re quite proud of that," he says. Post-recession, Meyers says, Bertram is thinking about selling its 47-year-old Miami River plant and relocating to one with more space, suggesting big plans for the Ferretti-owned company. "All options are open," he says. "We&apos;ll see what&apos;s out there and see what our property is worth." Others were looking beyond Lauderdale, as well - scanning the horizon with cautious optimism, expecting the market to "return to normal," albeit slowly and probably not to prerecession levels. They expect this market to reward those who operated conservatively before the recession and kept their noses to the grindstone and invested in innovation during the downturn. Conversely, those who are deeply in debt and can&apos;t afford to innovate may have a hard row to hoe. "We have no debt, and the cash we have is only down 10 percent over where we were a year ago," says David Hensel, director of brand and marketing for Grand Banks Yachts. "We run a pretty conservative company." Hensel hopes innovations like Zeus pod drives and joystick steering, which Grand Banks has incorporated in its 41 Heritage EU model, will help jump-start demand. "It&apos;s like when we moved from wood to fiberglass," Hensel says. "It could be one of those things that becomes de facto in time - this is how we power and move boats." Still, he is realistic about the future. "Normal is not going to be back to where it was - not for a long, long time." Sea Ray&apos;s Rob Noyes echoes this sentiment. Sea Ray introduced the 450 Sundancer at Fort Lauderdale, its sixth new boat in the last 12 months. "New product is the lifeblood of any product line," says Noyes, the company&apos;s vice president of marketing. "You have to differentiate yourself. You have to come out with new and innovative designs and products." Sea Ray has adopted Zeus pods or the Axius sterndrive system (both with joystick control) as standard propulsion on 16 of its models. "Joystick docking is going to play a big part when this industry turns around," Noyes says. Sea Ray, also celebrating its 50th year, has held its own in these tough economic times, partly by reducing dealer inventory to its lowest "in history" and by focusing on innovation and new product, Noyes says. The builder has mothballed its Riverview, Tenn., plant, ceased boatbuilding operations at its Merritt Island, Fla., plant, and slowed assembly line rates in response to soft demand. However, several weeks of furloughs planned for December and in 2010 have been taken off the schedule, and all remaining plants remain fully operational at reduced capacities. Meanwhile, the boatbuilder is preparing for better times, adding 14 new dealers in the last nine months and expecting to bring more aboard soon. Palladium Technologies, which designs yacht monitoring systems, alarm security software and entertainment systems for yachts 100 feet and larger, reported a "really good show" - in part because of new product offerings attractive to younger crews. "We were so busy Thursday and Friday I had trouble getting into our booth," says vice president Karen Blake. Palladium, which introduced the SiMON yacht monitoring and control system in 1991, has added entertainment systems and electrical switchboards to its product menu, and with its new iSiMON software, crewmembers can monitor a yacht&apos;s systems on their Apple iPhones. "We found with more yachts being crewed by younger crew, they are all very familiar with this technology," Blake says. Green products also continued to turn heads at Lauderdale. Mochi Craft, built by the Ferretti Group, introduced its new Long Range 23, a 75-foot diesel-electric hybrid expedition yacht hailed as the first "zero emission mode" motor- yacht of this category. Above the waterline, the yacht looks like a traditional passagemaker, but it rides what the builder calls a "transplaning" hull delivering greater efficiency with less pitching and rolling. "We decided to make two boats in one," says Andrea Frabetti, Ferretti vice president of engineering. The $5 million yacht has five modes. It can run on its twin 800-hp diesels alone, which when engaged with electric motors charge the yacht&apos;s lithium-ion ferride battery bank; without diesels, on two 70-kW electric motors powered by the lithium batteries and a generator; and silently in "zero emission mode" on batteries alone. Also, the yacht&apos;s house systems can be run on battery power alone, and there&apos;s a dedicated shore power connection for charging the batteries. Frabetti says the transplaning hull cuts fuel consumption 40 percent. Top speed is 16 knots in diesel mode, half that in diesel-electric. The yacht can run about three hours at 5 knots on batteries alone. Range is about 1,000 miles at 10 knots under diesel. Frabetti says the hybrid can reach cruising grounds under diesel power and once there slip into silent zero emission mode for a more eco-friendly and relaxing cruising experience. The Dutch, French, Germans, Italians and New Zealanders were well-represented at the show by their respective trade groups, with the Italians in particular turning out in full force, with 23 exhibitors and a lounge on the docks serving guests espresso, carbonated waters and cocktails - all gratis. Even in down times, you can count on the Italians to be chic and hospitable.